It is quite fitting that the Princess Bride is the first book I am going to review. It is by far one of my favorite book I have read. 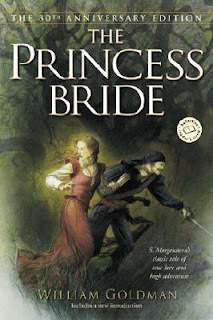 It is exactly what the full name implies (the full name being The Princess Bride: S. Morgenstern's Classic Tale Of True Love And High Adventure) It is highly debatable whether S. Morgenstern every really existed. I my self believe he did. And yes I know that some may be probably are thinking howstupidcanshereallybeitisalljustatrick. Well my question for those few of you who think so is simply this, why would he put himself threw all the trouble? Especially with the Morgenstern estate and the law suites he claims to have had to go threw. If in fact this is all a big hoax, he covered his tracks quite well. Who knows.. The only true one being William Goldman. Any way back to my review, if you are the kind of person who loves a good action packed book with the theme being based on the story of two people truly in love that this is for you. I think that Goldman really did a wonderful job abridging the book. The theme of this books is that Life is not fare and it is not about to become so. Threw out the book things go wrong. The wrong people die, the bad sometimes win. It does not even have a entirely happy ending (and for those of you who think it does because you have seen the movie so it really does have happy ending will have to find out what I am talking about by reading the book.) I do think that the book is better in some ways than the movie and it is a definite must read in my opinion, especially if you love the movie and just found out it was a book. Before I tell you about the plot I feel compelled to tell you about the characters first. Westly, the handsome farm boy who risks death (and much more) for the woman he loves; Inigo, the Spanish swordsman who lives only to avenge his father’s death; Fezzik, the gentlest giant ever to have uprooted a tree with his bare hands; Vizzini, the evil Sicilian, with a mind so keen he’s foiled by his own perfect logic; Prince Humperdinck, the eviler ruler of Florin, who has an equally insatiable thirst for war and the beauteous Buttercup; Count Rugen, the evilest man off all , who thrives on excruciating pain of others; Miracle Max, the kings ex-Miracle Man, who can raise the dead (sort of); and , of course, Buttercup… the princess bride, the most perfect, beautiful woman in the history of the world. For those of you who have not seen the movie or read the book the plot is simply this, Basically the whole story is about a farm boy and a milkmaid who fall in love. Westly (the farm boy) takes a voyage to seek his fortune to make money for marriage but his ship is attacked by pirates and he is killed. When Buttercup finds out that Westly, her true love is dead she promises to never love again. The Count Rugen sees of her exceptional beauty and tells the prince who is looking for a bride. The prince than commands buttercup to marry him or die. She says she will not love him and he does not ask for her love. All the while he is plotting he death but fails in every way, because of Westly, who in fact is alive and then gets killed and brought back to life (sort of) by Miracle Max.